I love those shoes!!!! Talbots, huh? Might be perfect with my wedding dress. I need flats, and I'd love something bright and cheerful under my gown. Have a nice trip! I hope it warm for you! Cute shoes! What dress did you get? I love those shoes!! I can't believe that happened. I never responded to you about grabbing coffee. I live in Westchester County, NY about 20 minutes outside NYC. I am almost certain that we are way too far to catch coffee, but I really would love to. These are darling! I picked up some great buys at Talbots when home. They have such steals in the sale section! You package is well on the way to your home, enjoy!! Love them! I just got two pairs of shoes from Talbots in the mail today and now I want to order more! 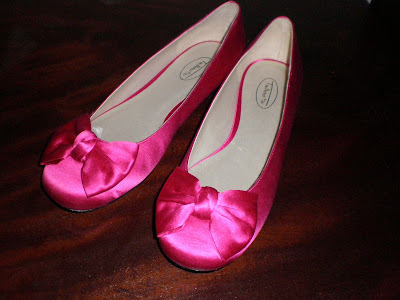 Cute shoes, love the pink with bows!! Can't wait to get out of snow boots and into some cute ballet flats and flip flops......sigh. And affirmative on seeing the sun...that was a nice thing.